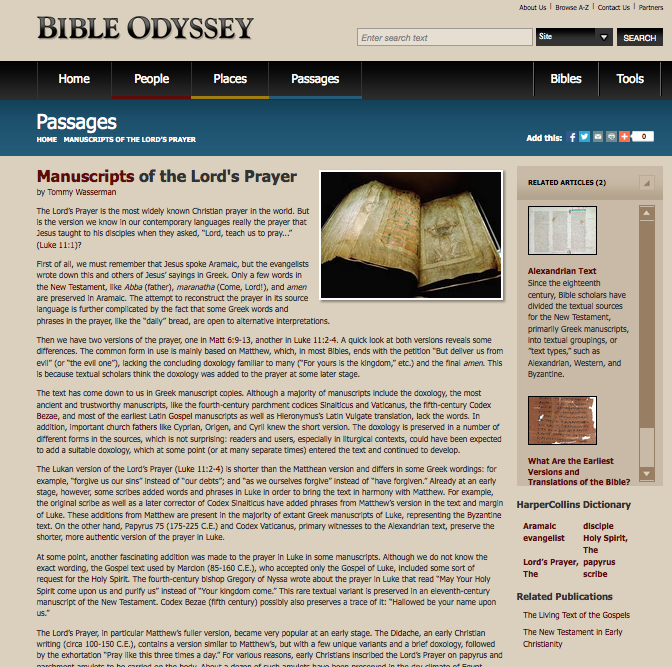 My new article on "Manuscripts of the Lord's Prayer" has just been published on the Bible Odyssey, a website developed and maintained by Society of Biblical Literature. On the Bible Odyssey, biblical scholars "share the latest historical and literary research on key people, places, and passages of the Bible." This was my second entry – I have written a piece on the "Alexandrian Text" last year. You can find a fuller report on the Odyssey project in that blogpost. There are various other entries related to textual criticism, and, under "tools" you can find a special timeline on the history of the text of the New Testament. Go on and explore! "the most ancient and trustworthy manuscripts, like the fourth-century parchment codices Sinaiticus and Vaticanus"
"the original scribe as well as a later corrector of Codex Sinaiticus have added phrases from Matthew’s version in the text and margin of Luke." Tommy, can you ask the person responsible for the "timeline" to verify the the following statements: "The New Testament was translated into the Bohairic dialect of Coptic in the third to early fourth century, although individual portions may have been translated at earlier dates. Later the Sahidic version emerged. A number of Coptic texts of the New Testament were found among the collection of the Nag Hammadi texts." Yes, one would have expected the reverse? Daniel, generalizations are inevitable in a text mainly written for a lay audience. It is perhaps also an advantage that readers can see that Sinaiticus, which preserves a very ancient text, in particular where it also agrees with Vaticanus, Bezae et al against the Byzantine Majority, but then again can be in error and reflect harmonization in a particular case. Thanks Ulrich, I have not personally checked the time line, although I noted that they had tied a film clip with Janet Soskice's account of the discovery of the Syriac MSS by Gibson and Smith at St Catherine's together with Codex Sinaiticus. I told the to change that. I recommend referring to Jerome as Jerome instead of Hieronymus. If one were to assume that the doxology in the Didache echoes the author's utilization of a copy of Matthew, how many generations away from the autograph of the Gospel of Matthew would you estimate such a copy would be? I mentioned that there is a doxology in the Didache, but it was not possible to account for the various forms of the doxology in the sources. The Didache reflect a liturgical context and I suggest that as the context where the doxology/doxologies were added to the prayer. Istm that a simple parableptic error elegantly explains the short (or shortened) doxology in the Didache. If the Didache echoes a copy of Matthew that contained the doxology, then how many generations away from the autograph of the Gospel of Matthew would you estimate such a copy would be? I do not think the Didache "echoes a copy of Matthew." I think it reflects the early reception of the Lord's prayer in a liturgical context. Do you really think no connection to the Matthean text of the Lord's Prayer is involved? What about other passages in the Didache that clearly have a distinct Matthean connection with no other real parallels? E.g., Did 1.3 which, though having some Matthean and Lukan connections, clearly has a distinct Matthean cast (e.g., "what reward," not present in Lk)? Similarly, Did 1.4, where "be perfect" and "forces you to go a mile" occur only in Mt and not Lk. The same with the use of the Matthean baptismal formula at Did 7.1; or giving what is holy to dogs at Did 9.5 -- these all reflect passages otherwise unique to Matthew. On the other hand, for a true "liturgical context" that is not related to Matthew nor any NT connection, the Eucharistic prayers of Did 9.1-4; 10.1-6 are good examples. Seriously, I think there is little reason to doubt that the Lord's prayer in the Didache, even while reflecting "liturgical practice", clearly derives from the Matthean form of such. Likely, your view relative to certain favored early MSS has impact on your conclusions at this point -- and this even when (at least some) consider the Didache to predate our earliest known Gospel MSS. Maurice, I do think that the Didache is dependent on Matthew, but I do not think the doxology is the initial text of Matthew, but was added early on. I understand what your (almost 100% pro-Alexandrian) position is. My question was, if your assumptions are incorrect, and *if* the If the Didache echoes a copy of Matthew that contained the doxology, then how many generations away from the autograph of the Gospel of Matthew would you estimate such a copy would be? CSPMT holds to the originality of the doxology in the Gospel of Matthew. The rejection of this reading dominates the West which is dependent where papyri evidence is lacking upon either Codex Aleph or Vaticanus. Of course in the East, the originality of the Matthean doxology is left unquestioned as to it's originality in the initial text of the Greek New Testament. The Hebraic chiasm found in the original text of Matthew is disrupted in the doxology's omission. Chiasm playing a large part in the Matthean pericope structure even as found in original Greek text. In addition, the 1st hand scribe in Codex Vaticanus was aware of it's existence in the fourth century. The distigmai in Vaticanus show both TR and Kappa Byzantine textual variations eliminating the possibility of the later Sepulveda theory for the origins of most distigmai found in Vaticanus. This variation is just one case where the TR and Byzantine types do agree in the distigmai markers found in Vaticanus but, this not aways the case. In other places they agree only with the Kappa Byzantine type and in others the TR along with minority Byzantine text groups. We are thankful the Traditional Text of the Greek New Testament is retains this vital original reading in the Matthean version of the Lord's Prayer. Without a doubt it was in the "initial text" of the Greek NT before being edited out by various old MSS such as Codex Aleph and Vaticanus. Paul, I think we cannot appeal to the distigmai to prove that those variants were known in the fourth century. This evidence is inconclusive at best. It is interesting to note that the Byzantine textual tradition of the Lord’s Prayer in Luke has typically harmonised it to the text in Matthew (this, I assume, is the opinion of all except the supporters of the Byzantine Majority Text). Concerning the Didache, we have one single witness for the doxology in Did. 8.2: Codex Hierosolymitanus, dated to 1056, so I think we should be very careful with this evidence. It is far from certain that this single MS gives us the correct text of the Didache as it was composed almost 1000 years earlier. Compared to Matthew, there are two other differences in the prayer (not found in any gospel MS). Further, concerning liturgical practice and the expectation of a doxology, it is interesting to note that the Didache (in the same witness) adds the identical doxology at the end of its prayer in 10.5 (post-communion). Tommy: "It is interesting to note that the Byzantine textual tradition of the Lord’s Prayer in Luke has typically harmonised it to the text in Matthew (this, I assume, is the opinion of all except the supporters of the Byzantine Majority Text)." Ah, but there's the rub . . . Had the supposedly "later" Byzantine text in Luke intentionally harmonized to the Matthean form of the Lord's Prayer, why did that presumed harmonization not incorporate the Matthean doxology, which by that time certainly would have been present in the Byzantine form of Matthew? On the other hand, given the liturgical practices that developed within the Greek Orthodox church, the liturgy had the people reciting the Lord's Prayer only through the last petition ("deliver us from evil"); the concluding doxology (later incorporating Trinitarian amplification) was reserved for only the officiating priest to declare. That consideration in itself might be a factor relating to the omission of the doxology in certain witnesses. I concur with Dr. Robinson on the the possibility of early omission (by some MSS) due to the early liturgical petition reserved for the officiating priest. Also, on the distigmai in Vaticanus the 1st scribe's apricot ink is clearly visible in these variations. Some are indeed later retraced while others are not. The viable variations are all there but, some are indicated by intentional variant spacing while other variants are indicated by marginal horizontal bars. So, it is not just the distigmai where variations are indicated in Codex Vaticanus. In addition, the Hebraic structure of Matthew (even though Greek MS “original text” demands the Matthean "doxology" original inclusion. Any omission would be a later Hellenistic modification at a later time just as the earlier Palestinian Gospel of Mark mentioned by Victor of Antioch as the more reliable MS than others of his day included the ending of Mark (16:9-20) also omitted by these few old MSS you favor. So, we can agree that we disagree again. Over reliance on a few MSS due to age with atrocious variants found in Codex Vaticanus such as the Mt 27:49b addition found in Codex Vaticanus seems tenuous at best. The few Byzantines which included this corruption are the more mixed Byzantines with other inferior readings. As related by H. Hoskier, Codex Vaticanus was written by an Arian at best, while Scrivener called it the product of the Arian age it was composed in. So, we disagree again. But, we hope that our dialogue can continue between our opposing viewpoints on the text of the NT in a Christian manner. Maurice, I don't see "the rub"... Partial harmonization to a parallell passage is very common in the textual tradition in general. Codex Sinaiticus is a good example, where certain phrases from Matthew are introduced, and even in different stages (one phrase is in the margin). The explanation that the doxology was omitted in copying context because of a certain liturgical practice seems farfetched to me. I grant that everything is possible but not everything is equally likely, and to me it seems that the addition of the doxology by scribe(s) is more likely than the omission (widely attested in the tradition at a very early point). In sum, the evidence is, in my opinion, overwhelming in favor of the shorter version of the prayer, without the doxology. As for the whole issue of distigmai, I count this as inconclusive evidence, regardless of ink color (apricot/black). Their presence remain suggestive and more research is needed (or publication of previous research, e.g., by Peter Head). 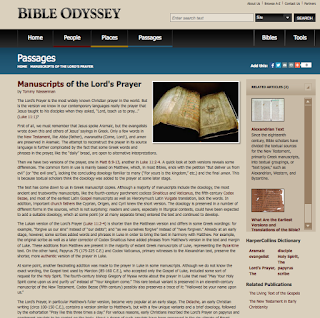 What are the production-dates of the earliest extant copies of the compositions by Origen and Cyprian in which they comment on the Lord's Prayer? What's that at the very end of Tertullian's De Oratione? And, would you say that the reading in Apostolic Constitutions, Book 7:24 ("For Yours is the kingdom forever, Amen," is also a liturgical intrusion, unrelated to the text of Matthew? Why do you consider the idea that a copyist omitted the part of the prayer that was omitted during group-recitation to be overwhelmingly improbable? Doesn't the evidence indicate that the early Alexandrian text-stream suffered some losses specifically at points that were liturgically or ceremonially significant, such as John 9:38-39a? If there, why not here? In Willker's commentary he mentions that the doxology is absent from five minuscule, including GA 190. Any ideas on what elicited that reading in those MSS? TW: "In sum, I agree with Metzger" -- yes; so I gathered. Restating your position doesn't make it more plausible. Jim, it sounds as if you have an article to write up. I will not debate this issue anymore, nor restate my position. Should readers want a fuller account of the evidence we have discussed, there is a chapter on the Lord's Prayer in David Parker's The Living Text of the Gospels. From a Traditional Text perspective on the original text wording of the Lord's Prayer in the Gospel of Matthew, please refer to Dean John Burgon’s, The Causes of Corruption of the Traditional Text, (pp. 83-88) found at www.cspmt.org in our resources section. I would like to at least make one comment on the subject. Tommy, you stated earlier in this discussion that "As for the whole issue of distigmai, I count this as inconclusive evidence, regardless of ink color (apricot/black). Their presence remain suggestive and more research is needed (or publication of previous research, e.g., by Peter Head)." While I understand your position here that at times the evidence can be "inconclusive", it is also true that many times the evidence is conclusive. To suggest that it is inconclusive, "regardless of the ink color [apricot/black] " seems to pretty much miss the point. If the distigmai are written in the same apricot ink color as the original text of Vaticanus, then the distigmai were written by the original Vaticanus scribe. If the original apricot ink of the distigmai is to be rejected, does it not stand to reason that the original apricot ink of the very NT text of Vaticanus have to be also rejected as not "original" or "inconclusive? It is not reasonable to reject the "apricot ink" of the distigmai, while accepting the "apricot ink" of the NT text of Vaticanus. They stand or fall together. One cannot be preferred over another. They both must stand and be accepted. Is it only by coincidence that the scribe of Codex Sinaiticus also seems to note this omission? Here the scribe has written a horizontal bar extending into the left margin under the exact line where the Doxology has been omitted. Is this his way of noting the omission? If it is, then the scribe of Codex Aleph also knew of the doxology and also omitted it. This would also make the Doxology older than Codex Sinaiticus. 6:13 evil: For thine is the kingdom, and the power, and the glory, for ever. Amen. I would like to make this my final comment on this subject. Vaticanus. There is also a stop or gap in the text showing the place of omission. This is evidence that shows that the scribe of Vaticanus was familiar with the Doxology and chose to omit it. It also shows that the doxology is older than Vaticanus.